I seem to have run into a flurry of cycling couples over the past few days. It only serves to underline how sociable cycling can be, whether they're both cycling or just one of them. It's not quite the same as driving down the motorway with your friend in the lane next to you. Here you're chatting, interacting, moving from A to B and back again together. To work, to the cinema, to a café, to a nightclub, what have you. And you do it regardless of age. With those you know or those you hope to get to know even better. And you do it on bike lanes wide enough for two or even three. 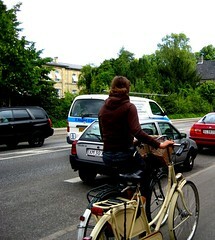 And if your friend or loved one isn't available, you can always take their bike for a ride instead. 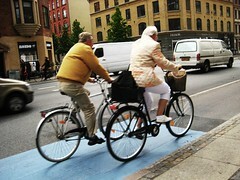 Moving along together on bicycles is a great sign of harmony and togetherness. each anticipating the ebb and flow of traffic and road conditions, individually controlling their bike to both travel together sharing the experience. My grandmother used to sing me a song about lovers riding on a tandem bike. This post reminded me of that song. I like it so very much that the post made you remember a song your grandmother used to sing to you. thanks for sharing that. When I spent a month cycling through the Neatherlands, one of the most endering sites was the teenagers riding side by side holding hands on friday and saturday evenings. I guess this is how the Dutch teens went on their dates. 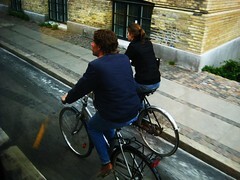 I took many bicycle related photos while on vacation, but I never did get an image that captured teens on date night. If you have one that you can post, it would make my "Dutch photo collection" complete. Thanks. If you check THIS LABEL there are many photos of couples. Perhaps something tickles your fancy. thanks for commenting! even though we're 1000 km from the Netherlands, i hope the photos will suffice!